Over the last four decades Philippa has designed and made over a hundred commissioned murals and also several pieces of sculpture. Now working with her son Daniel from the Black Dog of Wells studios, she is still happy to accept commissions. The examples shown here represent the range of size and approach possible in this richly textured, permanent and flexible medium. 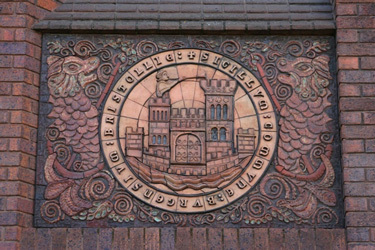 We have often worked with historical themes, and this shows one of fifteen panels depicting the History of Bristol. Made in buff and terracotta clays, this shows a 14th century seal of the burghers of Bristol surmounted on a local family's crest. The panels, each measuring 1500mm x 1000mm, were built into the first floor of an office block in central Bristol. 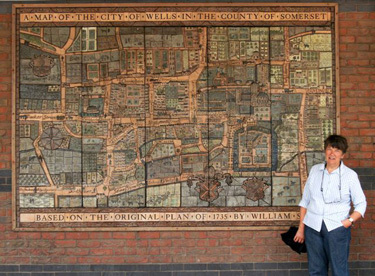 Shown on the right with Philippa, is a map of Wells in the 18th Century commissioned by Tesco for the entrance to a new superstore. It is based on an 18th century map with the street plan clearly recognisable and all the houses and fine detail seen in elevation. Many of our public commissions have a clear sense of place and the public readily identifies with the themes. 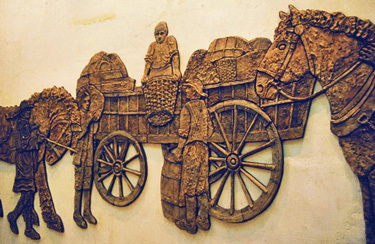 The mural is made of buff and terracotta clays and measures approx. 4200mm x 1800mm. Philippa has often incorporated the human figure into her murals, as in this instance. This mural was commissioned for a shopping mall in central Bath which was the site of a carters' yard in the 18th century. The mural depicts Carters at Work and is modelled free-form in buff crank clay with selective glazing. Overall size 4200mm x 1500mm. 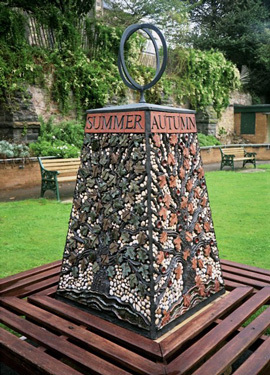 This smaller piece was commissioned for a Garden of Fragrance for the blind in Weston-Super-Mare. In this instance it was especially important to have a tactile surface and the ceramic is backed with natural pebbles and stone to add rich texture. The Four Seasons are shown on the four sides of the obelisk and made of glazed ceramic and stone. Overall height approx. 1800mm. Philippa has completed a number of commissions for private clients over the years. In many cases the client chose the theme and I designed the panel with their ideas in mind. These images give examples of some different approaches. The clients had a house in Provence and wanted to feel the atmosphere of a small French town when on the terrace of their London penthouse. 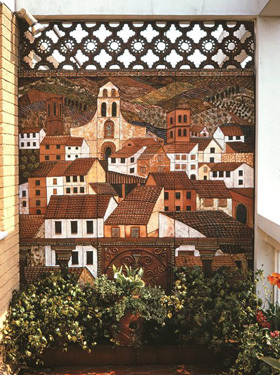 Fretted ceramic above the mural was introduced to allow light into the neighbouring terrace. Greenery beneath always enhances the ceramic, which is floodlit at night. 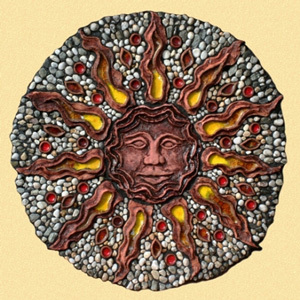 Small Town in Provence is made in selectively glazed buff and terracotta clays. Approx. 1800mm x 3000mm. A clients' kitchen window looked out onto a very plain wall. This Sun Panel was designed to brighten up the view. Rich modelling and melted glass are set against natural sea-washed pebbles, adding texture and colour to the outlook. The panel is made of glazed terracotta set into natural stone. Approx. 1070mm across. The clients wanted a panel to decorate the area associated with their swimming pool. Mediterranean Fish was chosen as the theme with modelled and glazed fishes sitting happily with the natural slate and stone. Approx. 2400mm x 700mm. This panel was commissioned by Swiss clients. 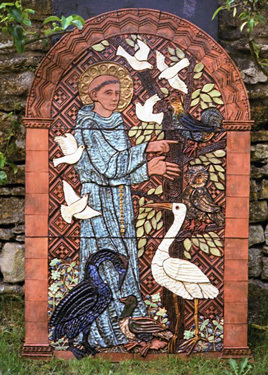 The theme is St Francis Preaching to the Birds and is loosely based on a mediaeval stained glass window in Switzerland. The panel is seen here in our garden prior to being shipped out to the clients. Modelled in terracotta with glazes and gold lustre. Approx. 1070mm x 1500mm.